Guest Post: Nasi lemak, sambal pedas and Coca-Cola! 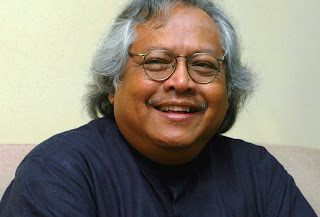 The following post was written by Distinguished Professor Shamsul Amri Baharuddin (picture) -- his retort to John R. Malott's article entitled The Price of Malaysia's Racism (The Wall Street Journal, February 8, 2011). Malott was the U.S. Ambassador to Malaysia, 1995-1998. 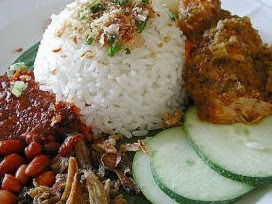 I am quite certain we can savour Malaysia's famous nasi lemak (picture) in New York and Washington DC as well as in Paris, London and Tokyo. But I guarantee that the one with the hottest sambal (condiment) can only be found in Malaysia. You can choose between the hot but sweet sambal (condiment) from Kelantan and the pedas (spicy or hot) cooked-in-coconut-milk sambal (condiment) from Negeri Sembilan. Visitors to Malaysia would be impressed by the wide variety of sambal (condiment) on offer, a topic even the Asian Food Channel on ASTRO channel has not dealt with. John R. Malott’s article (The Price of Malaysia’s Racism) reminded me of the nasi lemak in Philadelphia; when I tasted the rice dish, it was neither lemak (rich) nor pedas (spicy or hot). If Malott's opinion piece was meant to be a "stinging" (pedas) attack on the Malays, the Malay-dominated ruling party and the Malay leaders in the present government, it did not come close to criticisms of the present-day regime some local bloggers have been dishing out. But both Malott and the bloggers have a rather limited audience in Malaysia and abroad. And Malott is aware of this. Malott's commentary in The Wall Street Journal was not meant for the Malay-educated rural Malaysian or the Mandarin-educated not-so-rich urban Malaysians. It was a 'high-impact' review for potential investors interested in Malaysia. The moot question: “does Malott’s opinion matter to those who matter”? The answer is "no", if we take the Coca-Cola case. When Coca-Cola decided to invest Malaysian Ringgit one billion for its new factory in Nilai, Malaysia, the company’s decision must have been based on a thorough research into Malaysia’s present and future economic growth and socio-political stability. I am not surprised if Malott’s opinion did not matter at all to Coca-Cola. Why? Because it was not as pedas (stinging) as the Malaysian bloggers' critical comments about the Malaysian government which the Coca-Cola people must have read via a rehashed version, for example, the Economist Intelligence Unit country report. And all nasi lemak lovers agree that the "stinging" fizzy Coca-Cola is an effective American-manufactured antidote to nasi lemak with sambal pedas (spicy or hot condiment). Bravo Datuk, you have sent Mallot sambal from Negori.